This is one of my favourites in my personal collection. It is marked 12684-M and it is 5'6" x 19 i/4. It has the original winged keel which I assume dates it '84 era. "The Blonde Bombshell from Bondi"- It was the typically predictable headline that mainstream papers used whenever they featured an article on Cheyne Horan. Perhaps it was the classic surfer look - blonde hair, cheeky grin - that inspired such cliche, yet the irony was that Horan was anything but predictable or cliched. Never one to follow someone elses footprints Horan forged his own path during his long and successful competitive career. He experimented with diet, dabbled in alternative healing, and conducted an unrelenting investigation into his spirituality and inner life. In a homegenous and often stultifying culture the 'blonde bombshell' was a breathe of fresh air. 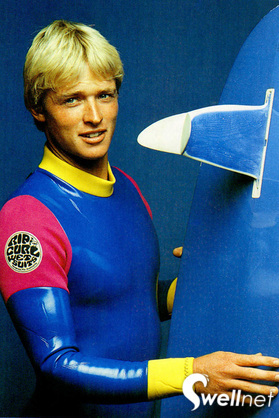 Lifestyle choices aside, it was surfboard design and his use of the winged keel - or starfin, as he called it - that most people will remember Horan for. 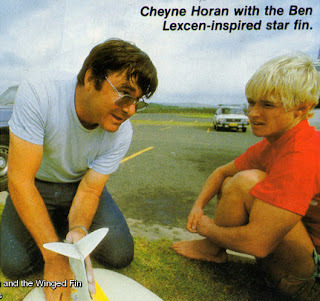 In 1983 Horan sought out Ben Lexcen, the genius designer behind the winged keel, used so successfully in Australia's 1983 America's Cup campaign. Lexcen made Horan a winged fin in the shape of a Spitfire wing (a British fighter plane used in World War Two) that followed the same principles as the winged keel. 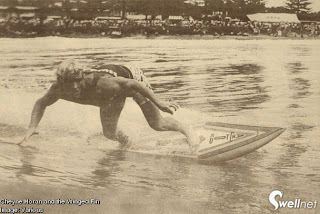 Horan had been a staunch advocate of Geoff McCoy's 'Lazor Zaps', the wide-tailed, needle-nosed boards which he rode with extremely skinny single-fins. At the time professional surfers were riding twin-fins and, increasingly, thrusters. Yet Horan persisted with single-fins, adding the starfin to the Lazor Zap planshape. He had immediate success, winning the 1984 Rip Curl Pro at Bells beating Tommy Carroll. In the subsequent years, however, Horan's professional career faltered as non-surfing influences took on greater meaning in his life, though he always persisted with the starfin design. Many commentators of the day thought that Horan was undermining his competitive potential by riding the unconventional equipment. In 1986 Horan fell outside the Top 16 for the first time since 1978. In 1989 he won the Hawaiian Billabong Pro and made the Top 16 for the last time. He did it while riding a conventional three-finned board. These days Horan is back on his beloved starfins and rides them most surfs.